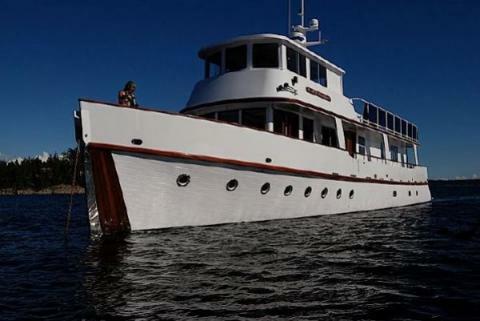 The owners of MV INVADER have recently completed a re-fit from the keel up at a cost of $2 million. Over 5,000 fasteners were used to refasten the 1 3/4" fir planks to the 3 1/2" steamed oak ribs. 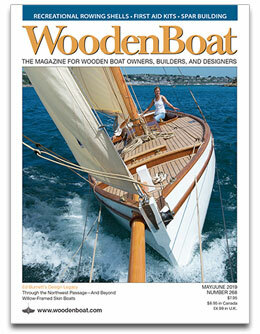 There are new bright-finished hull guards, cap rails and full gumwood ice guards. The new bulwarks and wheelhouse were manufactured from welded aluminium. This handsome superstructure with Diamond Sea-Glaze windows was drawn by Tad Roberts Yacht Design. Invaders interior was completely stripped and rebuilt using Sapeli mahogany with granite counter tops and commercial grade fixtures and appliances. All electrical wiring was replaced and custom panels installed. There is a new 16kw generator and battery banks. The Cummins KT100 diesel was installed in 2000. With a new exhaust system it is in excellent condition and drives the new hydraulic bow thruster and the hydraulic windlass and davit. Cruise the PNW with luxuries such as a steam shower, outdoor hot tub and modern entertainment systems. MV INVADER is moored in front on the Empress Hotel in beautiful Victoria harbour. Forward is a curved settee below the front windows. Port side is the dinette with a flat screen TV and on starboard is a beautiful liquor cabinet and access to the lower deck via an electrically raising counter-top. Midships is the gourmet galley. Aft is a salon with a staircase to the two guest staterooms. Comfortable electric reclining chairs face a BlueRay home theater. Double doors open on to the aft deck. Forward is the Master Stateroom with it's Island queen bed and more than sufficient wardrobe and packing space. There is also a home theater surround-sound system and tasteful mood lighting. To starboard is a huge steam shower in granite with a pebble floor. To port is the head and vanity also in granite with a pebble floor. In the forecastle is the laundry room and workshop. Aft from the salon, down a bright staircase are the 2 guest cabins. In the passageway to starboard is a fitted wine cooler and on the port side is a head with a granite top vanity and a separate shower behind a glass door. Both cabins have 2 x twin beds, cedar lined cupboards and drawers. The bridge deck with its 360 degree view and access to the boat deck is ergonomically designed. On port there is a dinette for guests. At the helm is the captains chair and 3 large monitors with electronics either side. On the boat deck is a hot tub, tender, davit with plenty of space left over to entertain and party. The galley is absolutely stunning. It has granite counters, a huge commercial stainless sink with garburator, new appliances which are all stainless steel finished and abundant cupboards and drawers. All electronics & electrical equipment were installed new during the re-fit. Now some history behind this spectacular vessel, MV INVADER later HMCS CRUSADER and then INVADER again. In 1935 she was owned by James Hoffar, Fred Brown, Ronald Graham and George Reifel, Vancouver BC. In 1936-1937 she was owned by Henry F. Reifel, Vancouver BC. In 1940-1945 she was acquired by the Royal Canadian Navy and served as a Patrol Vessel. In 1945-1949 she was owned by Henry Reifel, Vancouver BC. In 1953-1961 she was owned by Fred B. Brown, Vancouver BC. 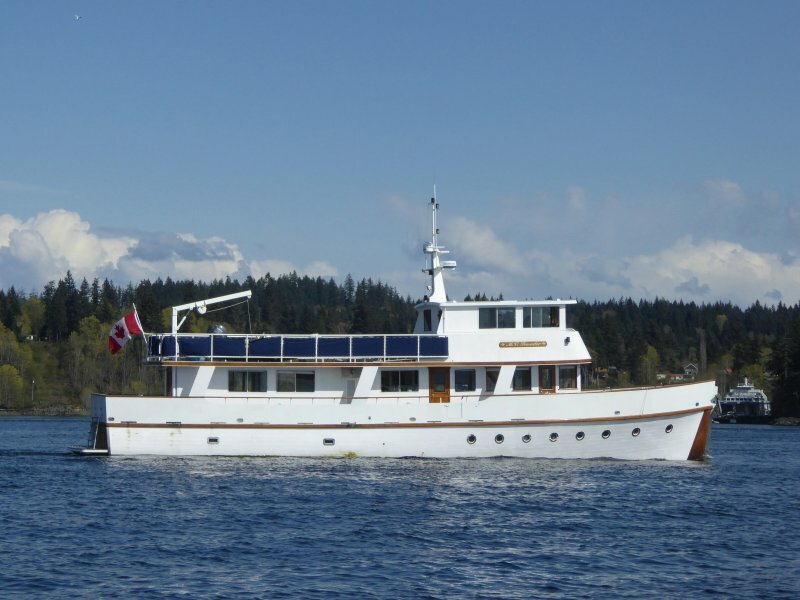 In 1962-2001 she was owned by Halfmoon Bay Holdings Ltd., Vancouver BC. In 2003-2014 she was owned by Coastal Mortgage and Investment Corp., Lethbridge AB.